If The Beach Boys doesn't ring a bell for you, then you probably either died before the middle of the 20th century or have just never listened to music before. The innovative genius of Brian Wilson's work with the band has spawned some of the most inspirational music of the last decade, closely rivaling with The Beatles as the greatest band of all time. Their 1966 album Pet Sounds (which I regard as the greatest album ever made) changed the shape of music forever, marking a departure of music from the generic radio-friendly format into a true art form. 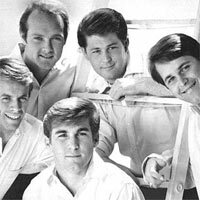 Following last year's release of the half-century old, mythical project The Smile Sessions, The Beach Boys have launched a full scale reunion this year with a new album, That's Why God Made The Radio. Whether the group still has its legendary charm or not is certainly up for questioning, but the band is no less than welcome to return as a band.